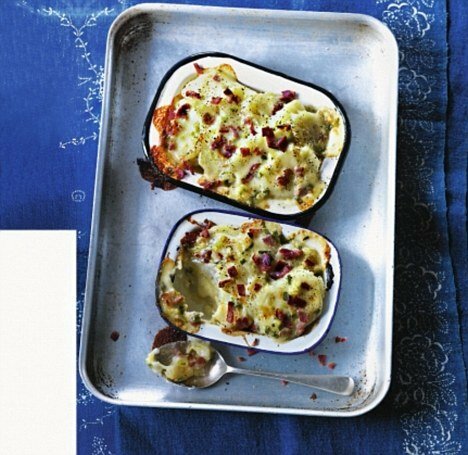 Try this simple dish that is baked in a single tray and will feed the whole family this weekend. Preheat the oven to 200°C/fan 180°C/gas 6. Boil the potatoes for 12-15 minutes until tender. Drain, and when cool enough to handle, slice. Dry-fry the bacon for 3-4 minutes until crisp, then snip into strips with scissors. Melt the butter in a large saucepan, add the onion and garlic, and cook over a low heat for 2-3 minutes until softened but not colored. In a small bowl mix the cornflour with 3 tablespoons of the wine until you have a creamy paste, then blend in the remaining wine and pour into the saucepan. Stir in both cheeses and grate over a little fresh nutmeg. Heat gently, whisking continuously until thick and creamy. Layer the potatoes, cheesy fondue and bacon into 2 small ovenproof dishes (or 1 large). Add another layer of each then bake for 20-25 minutes until golden.